Nepalese cuisine refers to the food eaten in Nepal. The country's cultural and geographic diversity provides ample space for a variety of cuisines based on ethnicity and on soil and climate. Nevertheless, dal-bhat-tarkari (Nepali: दाल भात तरकारी) is eaten throughout the country. Dal is a soup made of lentils and spices. This is served over boiled grain, bhat—usually rice with vegetable stew, tarkari. Condiments are usually small amounts of extremely spicy chutney (चटनी) or pickle (achaar, अचार) which can be fresh or fermented. The variety of these is staggering, said to number in the thousands. Other accompaniments may be sliced lemon (kagati) with fresh green chili (hariyo khursani). Dhindo is a traditional food of Nepal. Much of the cuisine is similar to middle eastern cuisine. It also has a high influence of south and central Asian cuisine. ^ "Pickle - Achar - Chutney". 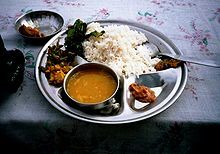 Food-nepal.com. Retrieved 2010-09-12. This page was last edited on 8 April 2019, at 12:06 (UTC).